I first learned to drive manual when I was 16 thanks to my parents’ long-term investment in a series of 1980s Volvos. In retrospect, they were great cars to learn on, since their engines made less than 100 horsepower, and the worst thing that could happen when you stalled out was a weak lurch forward. Still, my dad didn’t teach me to drive manual so much as he just kind of passed it down through osmosis. For years my goal was only to drive smoothly, like he did. As close as I could get it to feeling like an automatic. But I always wondered, too, if my version of smooth was optimal. Was I actually hastening the transmission’s demise by slipping the clutch too much? And engine braking feels awfully violent sometimes, huh? What about when I’d occasionally hear the gears grind? Over the years, I got a lot of different answers from a lot of different people—some of it seemed to make sense, some didn’t. If you bring up driving a manual in the right crowd, armchair experts come out of the woodwork. Anyway, I finally got around to asking an actual expert this week in the form of Wyatt Knox at Team O’Neil Rally School. When Wyatt isn’t disassembling manual transmissions to show you how they work, he’s teaching you how to heel-and-toe shift. He’s also a former Rally America champion, though we talked about regular driving, the driving of the masses. It turns out that my younger self was doing some things wrong and some things right. Take slipping the clutch, the term for what you do when you slowly lift your foot off the pedal to engage the clutch, but you don’t fully engage it, and you leave it hovering in a weird grey area. You might do this while easing your way into gear, you might do this while stopped on a hill so you when you restart you don’t roll back, you even might do this inadvertently while shifting in higher gears. But whenever you do it, Wyatt says, it will accelerate wear and tear of the clutch, even if some clutch-slipping (as minimal as you can stand it) is necessary, like when you’re starting in first gear from a stop. The reason? Clutch-slipping heats everything up, and all that heat on your clutch can fry it. If you do it for too long, you’ll destroy your clutch in the space of a few hours. The best release of the clutch pedal when shifting is quick but not too quick, since you also don’t want to just dump it into gear, both to keep the ride smooth and to protect the gears. Still, Wyatt said that if he had to choose between slipping and dumping, he’d go with dumping, since gears are pretty tough, and clutches less so. How Long Would It Actually Take To Destroy A Transmission Grinding Gears? Longer Than You’d Think. Which leads us to grinding, or that awful noise you hear when you engage the clutch halfway into the gear, or when you try to shift without disengaging the clutch and the revs aren’t matched, or when you’re coasting in neutral and you try to put the car into gear without first disengaging the clutch. The sound is very bad and even panic-inducing but, I was happy to learn, far from the end of the world. Wyatt says if you intentionally ground a gear, it would be an hour or two before it was stripped, meaning that “you’ve got a lot in the bank” before that happens, since most drivers hear the noise and within a few seconds remedy the situation by putting it back in neutral. Is Engine Braking That Bad? No, But It’s Not That Good Either. One thing my dad did that always confounded me was engine braking, or downshifting to slow down instead of using the brakes. A former auto mechanic, he used to say he did this to save the brakes, but that reasoning always felt a little suspect to me, and, indeed Wyatt said that if you want to protect your clutch and transmission long-term, you should shift into neutral, release the clutch, and then hit the brakes. And while this blog is aimed at normal people, and not maniacs, let’s say you really want to launch the car while causing the least amount of harm. One easy rule: Never put the pedal to the floor until the clutch is fully engaged. 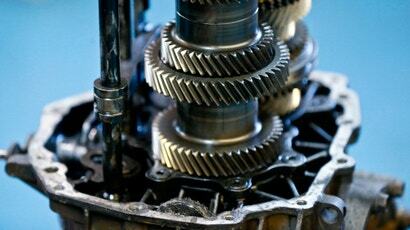 Before all that, though, rev the engine to 3,000 or 4,000 rpm, and release the clutch quickly but not too quickly. Too quickly and you’ll break the clutch then and there, too slowly and you might fry it. Best, though, for those of us who don’t have unlimited budgets, is to ease the car into first gear at much lower rpm and fully engage the clutch. After that, there’s no risk to the transmission at all. Feel free to punch it. "Wyatt said that if you want to protect your clutch and transmission long-term, you should shift into neutral, release the clutch, and then hit the brakes." Hope you're not driving a truck, because you're going to crash it. The other thing I recommend is learning to feather the gears. That's the term my brother gave it. It's basically putting 2nd, 3rd 4th gear, and so on without the clutch. Your clutch will last a lot longer this way. I have a 1999 eclipse with 160k miles and I've never changed the clutch.